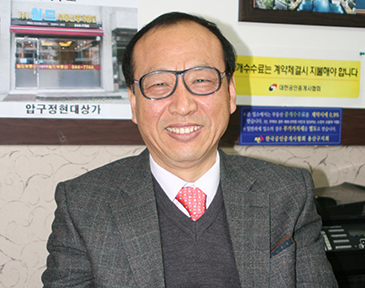 CEO & President Kim Ho-Kyeong of World Real Estate Co.
“Reliability, responsibility, and customer satisfaction are the main themes of our real estate services,” says CEO & President Kim Ho-Kyeong of World Real Estate Co. “Unlike others we aim to serve the direct interests of our customers. In a recent interview with The Seoul Times held in his office President Kim emphasized the importance of the professional real estate services by the experts. Based on scores of years of experience in this field the 57-year-old realtor aims to specialize in helping foreigners with their office and housing rental and leasing. Situated between Soon Chun Hyang University Hospital and Itaewon Hotel his real estate office takes care of the needs of foreigners seeking offices and houses. Kim has as many as seven experts as his staff. Four of them have a good command of English. CEO & President Kim Ho-Kyeong (right) of World Real Estate Co. poses with Director May Kim in front of the office in Itaewon in Seoul. A year ago Kim opened another office in Apkujeong-dong area in the upscale Gangnam area of Seoul in his efforts to better serve well off foreign customers. Kim says that Apkujeong-dong and Cheongdam-dong are the wealthy residential areas favored by foreign clients seeking expensive but nice residences. With their offices located in the key areas for expat customers World Real Estate covers nearly Seoul’s all office and residential areas favored by foreigners. They include UN Village, Hannam The Hill, Sungbuk-dong, Pyeongchang-dong, Gangnan area, Bangbae-dong, Cheongdam-dong as well as Itaewon-dong area. Kim and his staff are not merely involved in arranging offices and houses to the foreigners but they also deal in bigger real estate projects including land development, constructions, selling and purchasing building and their remodeling. Their customers include nation’s such major companies as Samsung Electronics, Korean Air, Marriott Hotel, and some foreign embassies. Kim says that the nationality of his customers varies. They come from America, Germany, England, Middle Eastern countries, and even from such remote countries as Mongol and Nepal. They favor villas over apartments and regular houses. “Our customers all prefer fully furnished villas with private terrace,” Kim says. “They also tend to choose ones with a strong security system. Mediation between landlords and tenants for housings and offices, and the around the clock on-call service for their needs, and buildings and office maintenance services are the main services Kim offers. 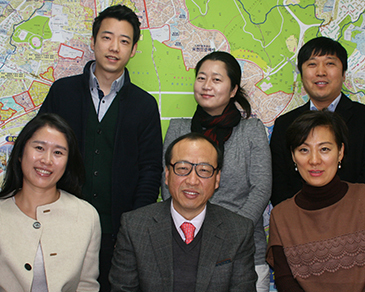 CEO & President Kim Ho-Kyeong (center in front row) of World Real Estate Co. poses with his staff in his office in Itaewon. World’s “one stop service” covers contract preparations. Customers counseling, contract commencement, customer residence, and contract expiration & termination. Kim’s World Real Estate Co. is different from others in size and the quality of the services they offer. Unlike others manned by one of two realtors they have two other branch offices in Seoul’s key areas and seven seasoned full-time staff is highly trained. Director May Kim (Mobile: 010-9966-2270) and two other staff have international experience with full command of English. But the biggest difference is that Kim’s office is an officially corporation whereas most of the real estate offices dealing with foreigners are a small and private companies. Kim is proud that World Real Estate Co., Ltd is a professional real estate company with the top reputation in the nation. World has been in service in the market for more than 10 years, helping a number of foreigners with their various needs in the nation.